Google has officially launched Penguin 4.0 This new version of Penguin is the long awaited real-time Penguin that eliminates the long wait for site owners to recover if they have been negatively impacted by Penguin. Gary Illyes, part of the Google Search Ranking Team, as well as a Webmaster Trends Analyst at Google, announced the Penguin update on the Google Webmaster Blog just now. This new Penguin, the first update to it for two years, has some significant differences and changes from the old version of Penguin many are familiar with. 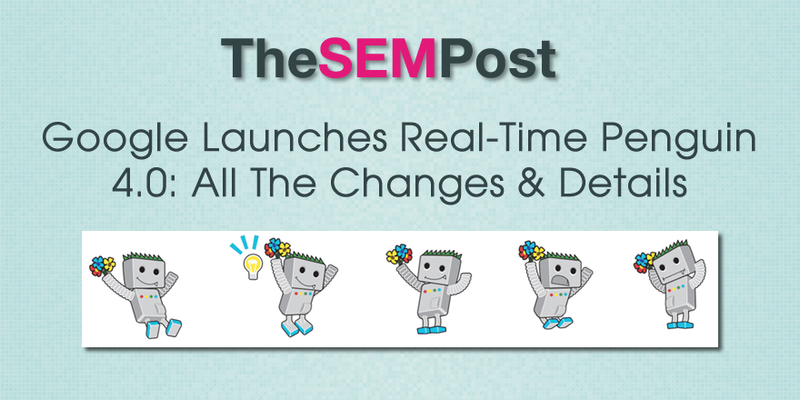 Here is what SEOs need to know about this new real time Penguin update. Penguin has joined Panda as part of Google’s core ranking algorithm. This means it is “baked into” the Google search algo, which consists of over 200 different signals. From an SEO perspective, Penguin being part of the core algo won’t have any different impact on the search results that would be visible to searchers. But it means that it is now part of the main search algo rather than a filter. Penguin now joins Panda as part of the core algo. I confirmed with Google that this update will be rolling out to all languages and to all countries. So this isn’t the case is doing a restricted roll out to specific countries or languages first. Searchers world wide will be able to see these changes starting to roll out now. Yes, this is the real-time Penguin that many have been waiting for. This means that site owners will no longer need to wait for a Penguin update or refresh to happen in order to recover from Penguin. With this change, Penguin’s data is refreshed in real time, so changes will be visible much faster, typically taking effect shortly after we recrawl and reindex a page. So a page’s rankings will be reevaluated every time Google recrawls the page, and the impact of any incoming links – and spam – will be adjusted immediately. Now, this still means that Google needs to crawl those pages where the spam links are, so that a disavow will be processed or for Googlebot to see that the link is no longer on the page. But now those rankings can be adjusted in real-time, rather than waiting for a push. Google has said that “Penguin is now more granular.” But what precisely does this mean? I asked about the term granular and whether it meant Penguin could just impact single pages on a site, such as if someone built spammy links to just one internal page rather than the homepage. “No, it means it affects finer granularity than sites. It does not mean it only affects pages,” a Google spokesperson confirmed to The SEM Post. Real-time also means that Google is no longer going to make public comments about Google Penguin updates. It also means we’re not going to comment on future refreshes. This actually matches Google’s response to Panda, once they changed it over to a long running cycle from the former Panda updates that needed to be pushed out. But with it being real-time, and being part of the core, it is likely SEOs wouldn’t notice major changes to the real-time Penguin algo, given how Google crawls the web and any changes not being applied to sites and pages until they are recrawled. Were Recent Fluctuations Penguin Testing? The past few weeks, there has been a lot of speculation about whether the recent fluctuations some were spotting in the search results was actually Penguin. While some people speculated that it was link based, it didn’t seem that sites impacted by Penguin were seeing any real changes that one would expect to see if Penguin released. Google also does regular quality adjustments to their search algorithm, and when these core changes are made, Google rarely ever comments publicly on them, often because they aren’t actionable. Google did confirm they were making their regular algo adjustments they do on an almost daily basis, too. We also know that Google uses their quality raters to test their algorithms too. So their “testing”, as was mentioned in the blog post, may not have been in the live search results but with a closed environment with their quality raters. Can Sites Be Impacted Negatively By Real-Time Penguin? Many SEOs have been talking about the recovery aspect of Penguin, but as Penguin is now part of the core, that means part of what Penguin does is also negatively impact sites with bad link issues. So yes, sites can now discover they have a brand new Penguin issue. How Quick for Recovery from Previous Penguin? This is the question that many site owners who have been previously hit by Penguin will be asking. Should sites see recovery right away? Technically, once Google has recrawled a page after launch, then site owners should see some changes if they have removed enough of the bad links. Site owners could do fetch and render on their important pages to trigger recrawls, but that also depends how long the real-time Penguin rolling out takes. Google knows that many site owners are waiting for this update, so I wouldn’t expect this roll out to take too long. How Quick for Penguin Cleanups Done Starting Now? One great thing about the new real-time Penguin is that site owners can now see changes much more quickly. So as links are removed and disavowed, these changes will be reflected much faster in Google’s search results. Site owners will not have to wait for a refresh, update or cycle in order to recover. This makes it different from Panda which is on a long duration cycle. Penguin is real-time as the changes can be reflected immediately with recrawling both the site and the links. What If No Recovery is Seen? I asked this question to Google, and the Google spokesperson responded with “It depends on many factors,” without offering further details. However, there are signs of why recovery might not be seen that is expected. First, keep in mind that it is rolling out, so you might not see recovery the minute Google announced that Penguin has been updated. Second, with the last Penguin update being two years ago, if someone had cleaned up links two or more years ago, there is the chance that there still could be some bad links pointing to the site that were viewed as high quality links at the time. A few years back, some ways of building links were seen as fine, while today they are definitely viewed as problematic. This is something they allude to in the blog post. The web has significantly changed over the years, but as we said in our original post, webmasters should be free to focus on creating amazing, compelling websites. And some of the sites that previously had high quality links two years ago could be a low quality site today, if the site was abandoned or the site changed owners. And for sites that were impacted by one of the early versions of Penguin – it first launched in 2012 – the web is a much different place than what it was a mere year or two ago. So there is the danger that recovery work that is years old might not pass today’s standards when it comes to spammy links. It is worth noting that Google has not changed their linking guidelines in conjunction with this new real-time Penguin. “We haven’t changed our linking guidelines, found here,” a Google spokesperson told The SEM Post. Google’s linking guidelines are still the same and still apply to all sites in the search results. I also asked if there were any changes to how disavows should be used now that Penguin is realt-time. “We haven’t changed the disavow feature or our recommendations for it,” a Google spokesperson confirmed with The SEM Post. So disavowing bad links is still a viable option for removing bad backlinks, but Google still recommends that you try and remove those links from the websites, rather than just using the disavow tool. @glenngabe OK, clearer: no change on using the disavow file. Use it thoughtfully, as always. While many SEOs spend a lot of time focusing on Penguin – or on Panda – it is important to remember that Penguin is merely one piece in the algo puzzle that has at least 200 individual and unique signals that make up Google’s core searc h ranking algorithm. It’s also important to remember that updates like Penguin are just one of more than 200 signals we use to determine rank. And links aren’t the only important part of the algo, although it is believed that they do have a very strong influence. Google’s algorithms rely on more than 200 unique signals or “clues” that make it possible to surface what you might be looking for. These signals include things like the specific words that appear on websites, the freshness of content, your region and PageRank. Over the next week or so, we should be hearing plenty of recovery – or non-recovery – stories from site owners who have been anxiously awaiting the Penguin update, as they analyze the changes their sites have made. I would expect that the SEO weather reporting tools will also see a spike related to the changes as sites are freed from Penguin or are now impacted. It is important not to forget that this update isn’t just for lifting old resolved Penguin issues but it can apply new ones. I will update as more information becomes available.